Dimensional control is systematic technique may help to ensure the product dimensions as expected measurements and meets the standards & technical requirements. Dimensional control is process establishment require for managing all the product dimensions that is product sizes and require parameters. That needs as per product standards, process standards, and measurements as per requirements of customer end application standards and technical requirement. That may conduct to proper controls over activities of manufacturing processes. Each activities of producing materials at facility by monitoring that is frequently inspection on activities. Measuring dimension management of product during in-process inspection. Sampling inspection and final testing of product to ensure the product quality and ensure the tolerances of product dimensional requirements for customer satisfaction. To meet to end application requirements. dimensional control process is handle by quality team. Quality team is identify requirements that is control measure to frequently monitoring on product dimensions by various inspections processes. Visual inspection, measurements of product dimensions verification are conduct though required quality inspection. Identify tolerances occur in product dimension as per drawing requirements of product and product standard system. The controls requirements are identify during inspection, measurements are conducted during various processes of parts of testing that managed its implementation in tolerances controls of product dimensions. The dimensional control procedure is handle to develop the proper guidelines. To provide such guidance to concern peoples and control of structural manufacturing activities. That product dimensions are maintain during producing materials. The documentation are maintain and update accordingly to processes are handle during define activities. The application of processes are raise. To ensure all product dimensional is accordance to customer specifications, provide drawings & technical sheet. To also should comply requirements of international standards. All equipment are use for measurements should be proper calibrate, mostly measurement instruments and devices like vernier, gauges, ring gauge etc. It should be maintain and calibrate well as per frequency defined. And the measurements instrument, devices and equipment should be done qualified calibration engineers. In case of third party should be certified for calibration. In some cases customers are provides the guidelines to supplier for managing its requirements of dimensional of product needs for end application requirements. So the customers are also verify the records of calibration, measurements instrument concern documents. The third party / customer witness the tests that needs to proper care of each process handled concern the measurements of product dimensions. The measurement method is also one of the important part of the dimensional controls concern the manufacturing of product and its standards system requirements. The process of dimensional controls should be proper verify & implement by concern authority. It should be manage and needs to ensuring all the measurements are in accordance with the international product standards and customer technical sheet. The concern quality inspection teams and measurement reporting are maintain require information are handle accordingly. The measurement methods and measurement of product shall be carry out with the requirements of product dimensional control system. It should be handle since the raw materials receive. The same the product in in-process activities to final product are also consider in the measurement requirements. The method should be conduct for measurements are as per standards system which is acceptable by customers as well as international standard system for particular product and its dimensions. The dimensional control process are handle to considering flow that define by concern management. That is quality team, quality management is responsible for establishment of proper dimensional control flow, awareness and training. To all concern peoples to aware about the flow of dimensional controls & quality peoples are handled and conduct tasks accordingly. Generally primary dimensional checking are conduct by concern supervisors and sending the reports to quality department for further actions. Quality teams are verify the reports and conduct further actions that are checking visual dimensional verification, testing and reporting accordingly. In case during the quality testing and verification any deviation identify that needs to further investigation on it. The process is handle by qualified quality inspection team, for compliance of requirements accordingly to customers acceptance policy. Once the issues are identify that rectification of the product dimension is conduct in line with issues and product technical and specification requirements. The reporting approvals from customers are handle by quality managers for implement points that rose by customers. The change effectively manage in system. The same the reporting process is handle by responsible personnel. 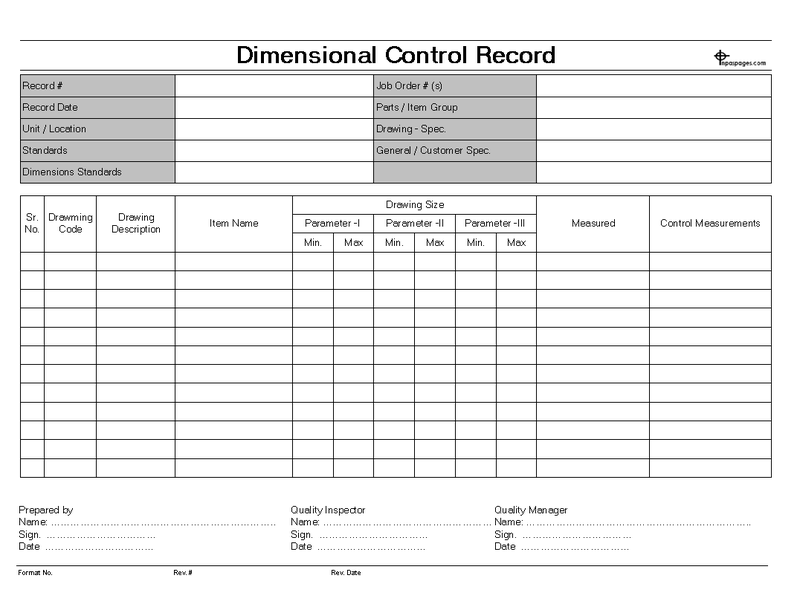 The dimensional control records prepare by quality department. The quality inspection team is responsible for establishment of dimensional control concern activities and managing records. Once the completion of all require tests and visual inspection as well as measurements of each product dimensions. The acceptance of each processes from quality manager for the product dimensions. The team is finalize the records for customers presentation and provide the same. The documentation are maintain, update, storage and disposal process is handle as per documentation system of organization. Its disposal are conduct as per retention period.